You might have a different technique than others, and that’s okay! Denise Duffield-Thomas, I help women release money blocks, and create outrageously successful lives. Come over to www.LuckyBitch.com and get started today. Is there ONE magical way to write your goals? A process to rule all processes? I get asked this question several times a week. Denise, am I doing it right? How should I do this? I wish I could tell you that there is ONE magical formula to goal setting. That if you stand on one leg while you’re chanting your affirmations and write them in gold ink at 11:11am every day, then they have more potent power. That all your dreams will come true because finally… you’re perfect. The truth is that INTENTION is way more important than perfection. I don’t think the Universe cares HOW you do goal setting, as long as you have clarity on what you want. The HOW is just ritual. Humans LOVE ritual and I do think that it’s important. But if you look through history, different tribes had different ways of achieving the same thing, like appeasing the gods or praying for rain. Who was right? Well — maybe the intention, belief and collective focus was the most important thing rather than the actual method. Everyone learns differently and you’ll be more touched by one modality of learning than others. Saying that there is ONE way to do goal setting really restricts you from experiencing the full flavor of your manifesting ability. Because everything works, if you believe it does. Clinical trials using placebos have proven it time and again. Belief is powerful. Intention is powerful. But if you wait for THE perfect system, then you’ll probably never do it. You’ll procrastinate and avoid even trying. Your dreams are too important to leave to chance or an arbitrary process. But that doesn’t mean you do nothing. Because you’ll have no forward motion. If you get into positive action and act in intention, then you’ll notice synchronicities and opportunities that you wouldn’t have noticed before. The rituals strengthen your belief. Your positive beliefs that you deserve it and are worth it, lead you to take positive action. It becomes a beautiful compounding effect. Conversely when you do nothing, you might not see the opportunities and if you do, you might think that they aren’t for you. You’ll act in ways that aren’t conducive to your goals, or worse, you’ll stay in inaction. This has a neutral or negative compounding effect over time. No forward motion, no positive outcome or you’ll stay where you are. Simple. It’s not magic, it’s actually really practical stuff. Here are some ideas for you to better achieve your goals. Take what resonates, leave what doesn’t. Go visit your dream house or dream car — test drive it. Breathe in the air. Remember, there are many paths to your goals. 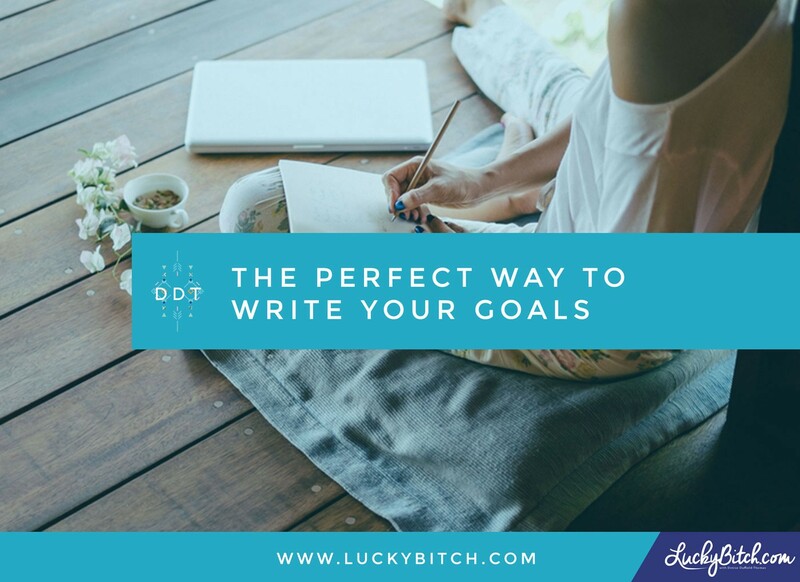 There is no such thing as THE perfect way to write your goals. In fact, as you just saw, you don’t even need to write them if that doesn’t resonate for you! Try as many of these that resonate with you as possible. Leave the ones that don’t feel good. Don’t get caught up in the details (for example, the EXACT EFT script). Just try it with intention and see what happens. Of course, I don’t claim that it’s THE perfect system but honestly it’s an awesome one. I’ll take you through my 5-step process that really helps me when I have a big goal. Try it and see. It’s totally free. Did you miss last week’s post? Check it out here: Do You REALLY Need A Business Plan? Originally published at luckybitch.com on February 10, 2016.